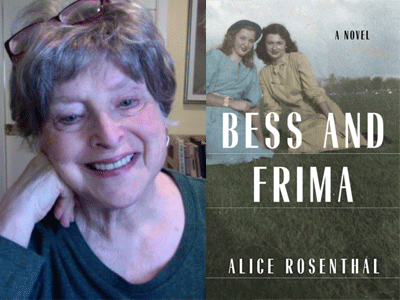 Local author Alice Rosenthal shares her lyrical debut novel, Bess and Frima. When Bess and Frima--best friends, both nineteen and from the same Jewish background in the Bronx--get summer jobs in upstate hotels near Monticello, NY, in June 1940, they have visions of romance . . . but very different expectations and needs. Frima, who seeks safety in love, finds it with the "boy next door," who is also Bess's brother. Meanwhile, rebellious Bess renames herself Beth and plunges into a new life with Vinny, an Italian American, former Catholic, left-wing labor leader from San Francisco. Her actions are totally unacceptable to her family--which is fine with Beth. Will their young loves have happy endings? Yes and no, for the shadow of world war is growing, and Beth and Frima must grow up fast. As their love lives entangle with war, ambitions, religion, family, and politics--all kinds of conventional expectations--they face challenges they never dreamed of in their struggles for personal and creative growth. Books Inc. proudly hosts hundreds of authors a year, from house-hold names to local, debut authors and we look forward to continuing to provide the Bay Area with the “Experience You Can’t Download”. The majority of our events are free and open to the public; all that we ask is that you have a Books Inc. receipt to join the signing line. Sales equate success, for the publisher, for the author, and especially for an independent bookstore. The more books we sell at our events, the more authors we have sent our way. Please help us keep the Bay Area the wonderful literary hub that it is by supporting your local Books Inc.